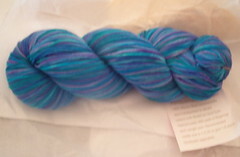 Nicole's Needlework: Sweet Shop Sock Yarn! I was thinking of possibly using it for Grumperina's Jaywalker socks. I need to finish at least one pair of socks first though. I have too many started. Although... I was thinking of ripping those lorna's laces socks. Well, not much else going on here. Just waiting, waiting, waiting... only 5-6 more days until I can test. Argh, I can make it, right?